We already talked about what happened in Octavio Dotel’s wake in Pittsburgh. Now it’s time to examine the new closer situation in D.C.
Matt Capps left for Minnesota and left an open job behind him. It’s not entirely clear who will assume the mantle there, though there is an early favorite. Drew Storen is thought to be the guy to become the closer in Washington, because he was drafted in the first round and was given the title of Closer of the Future. Was the hype warranted? Yes and no. The no first: Storen is not currently showing any elite results. His strikeout rate (7.62 K/9), walk rate (3.84 BB/9) and groundball rate (37.9%) are all below average. He does have what might be described as a ‘closer’s arsenal,’ with a 94.5 MPH fastball, an 84.4 MPH slider, and an 82.5 MPH curveball. All three pitches rate as net positives according to the Pitch Type Values at FanGraphs.com, which use changes in the state of a game to evaluate each type of pitch. It’s also important to remember that Storen is only 33 innings into his major league career, and had a double-digit strikeout rate in the minor leagues (10.7 K/9). Elsewhere, Tyler Clippard has finally turned a nice strikeout rate from the minor leagues (9.2 K/9 career, with most of it starting, higher as a reliever) into good numbers in the major leagues this year (10.18 K/9). On the other hand, he has a scary walk rate, both this year (4.24 BB/9) and for his career (4.80 BB/9). Also, if Storen is a slight flyball pitcher (and this at risk of giving up deadly home runs) Clippard is ridiculously so (55.1% flyballs this year, 56.3% for his career). Last but not least is the man that actually garnered the first post-Capps save: Sean Burnett. Burnett has no obvious flaws – his strikeout rate (8.38 K/9), walk rate (3.26 BB/9) and groundball rates (56.6%) are all better than average for a reliever, and passable for a closer. On the other hand, there’s the fact that his career rates (6.05 K/9, 4.17 BB/9 and 52.6% groundballs) are all below his current performance. Also worth noticing is his handedness. Southpaws are sometimes shunned by managers when it comes to picking a closer – there are only two lefties in the top 25 in saves right now. It probably has to do with the fact that lefties are more often used as specialists. Burnett’s platoon splits are also troublesome: In his career, he has struck out 11.15 per nine innings against lefties, but only 6.56 per nine against righties. This is not an open-and-shut case. Storen doesn’t have the obvious flaws that Clippard does, and he also doesn’t have the platoon split that Burnett has shown so far. Those factors, plus Storen being the 10th pick in the draft and thus someone the club would more likely lean on, make him the man to pick up. Burnett may steal the odd save when a lefty-heavy lineup comes up in the ninth, but Storen should get most of the Nationals’ saves for the rest of this season, and in future seasons. 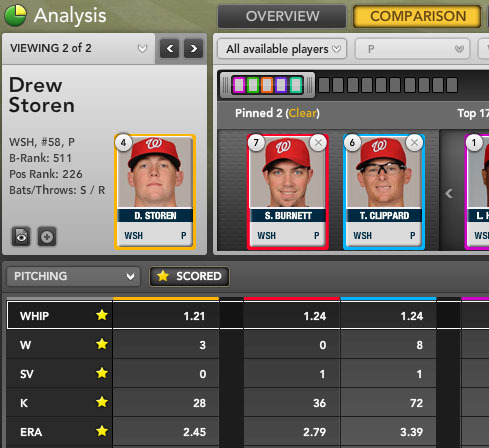 For more on Drew Storen and other closer candidates, check out Bloomberg Sports’ Fantasy Tools.